Vang Vieng is famous for its idyllic aquamarine-coloured blue lagoons. Read on for how to get to the blue lagoons, the differences between them and which one is my personal favorite! Though there are a number of incredible things to do in Vang Vieng, frolicking in the blue lagoons of Vang Vieng is still one of the most popular things to do in Laos. People travel from all around the world just to see the turquoise-coloured pools and to go for a swim in the cooling waters. 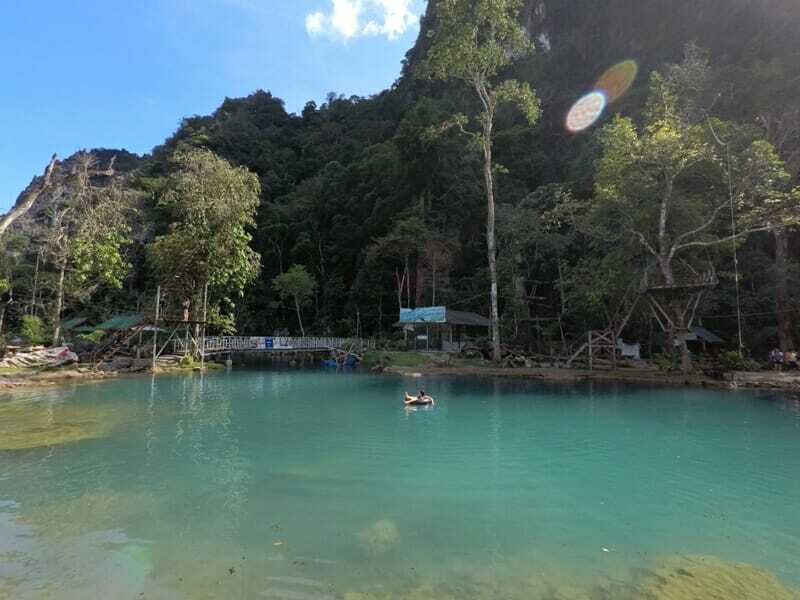 Most travelers in Vang Vieng flock to Blue Lagoon 1, but what many people don’t know is that there is more than one blue lagoon in Laos, including the “secret” Blue Lagoon 2 and Blue Lagoon 3. Wondering which blue lagoon is the best one? 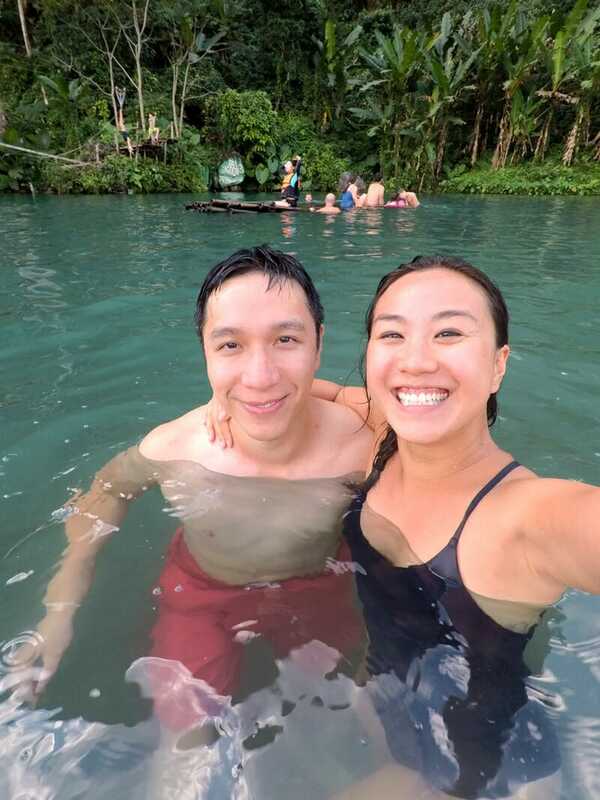 Here’s what you need to know about the blue lagoons in Vang Vieng, how to get there and which one is the best one to visit! But first, a few basics if you’re headed to Laos. You can get to Vang Vieng from Luang Prabang or Vientiane. It is possible to apply for a visa on arrival in Laos at both airports for most nationalities – bring 1 passport photo and US dollars for the application fee, though they might also accept Thai Baht. The Laos visa-on-arrival fee varies between about 30 USD to 40 USD depending on your nationality (+1 USD for the visa service fee), and in general the Laos tourist visa is good for 30 days. 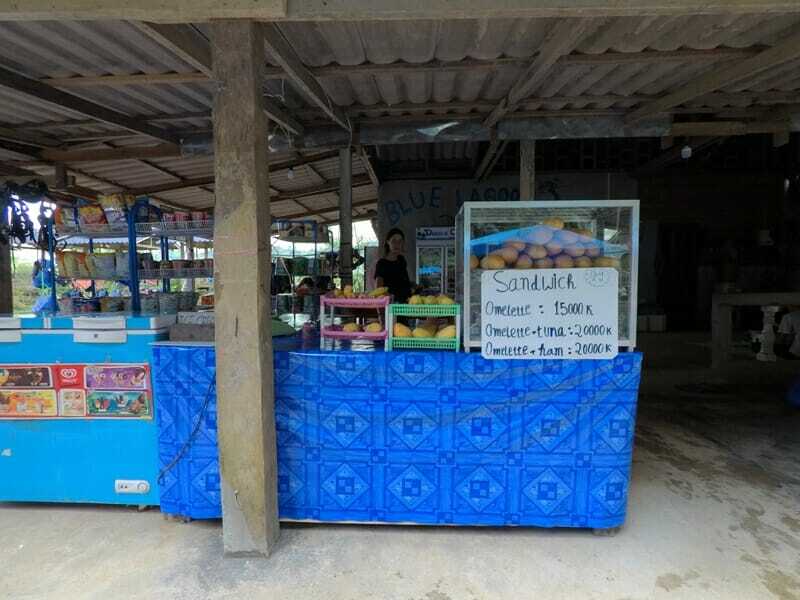 You can get a local Laos SIM card at the airport for very cheap, and internet connectivity is surprisingly strong. Before you travel to Vang Vieng, make sure you download these maps to your phone from Hobo Maps: Vang Vieng town map, Vang Vieng area map & Vang Vieng north map. Most places in town will sell hard copies of the map but you can access them for free online. The currency is the Lao Kip, and the exchange rate varies from approximately 8000-8600 LAK: 1 USD. There are plenty of places to exchange money in Vientiane, Luang Prabang and Vang Vieng itself, and there are also ATMs where you can withdraw money. 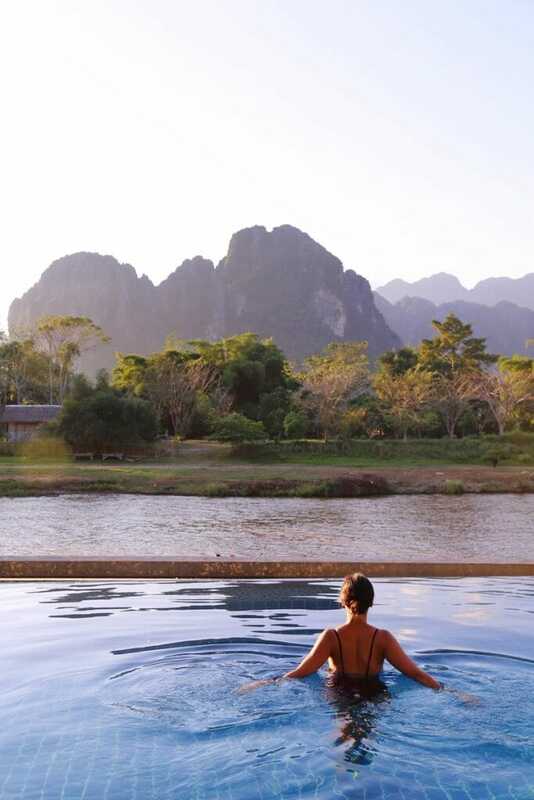 The best time to visit Vang Vieng to swim in the blue lagoons is from around October to March. During this time, the blue lagoons are nice and actually blue (rather than brown and murky – see the photo below!). The summer months can be miserable with torrential downpour, but the rain means that the rice paddies are lush and the waterfall is stunning from June to August. There are other places to visit in Vang Vieng that aren’t the blue lagoons, head on over here to read more! 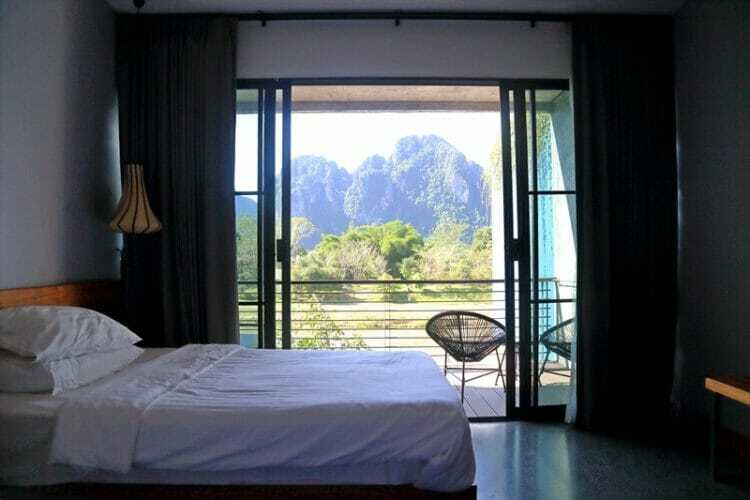 Inthira Vang Vieng is a riverside boutique hotel in town that offers beautiful rooms with a view overlooking the Nam Song. The rooms are spacious and tastefully decorated, the bathrooms are fantastic with wonderful water pressure and the staff always go out of their way to help and make your stay more enjoyable. 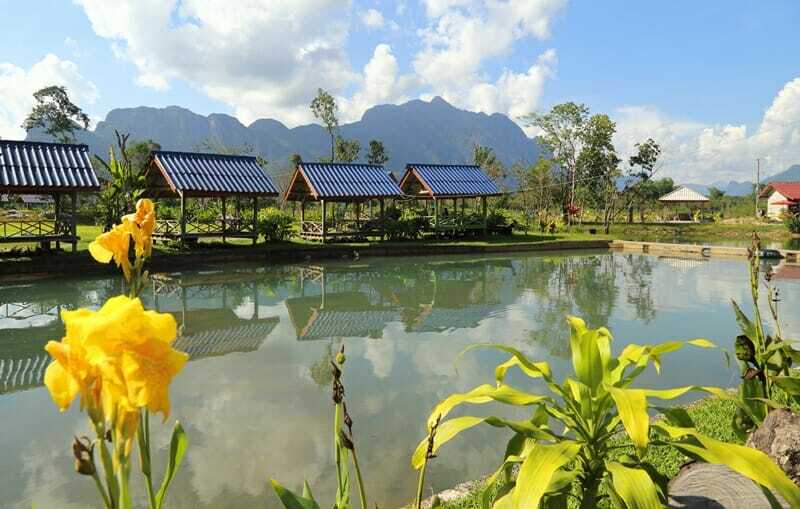 Click here to see current rates at Inthira Vang Vieng. The Silver Naga Hotel is just up the street from Inthira and also sits right on the Nam Song River. Like Inthira, is has an infinity pool and is home to Yoga in Vang Vang, a yoga studio running 2-3 classes each day. I would recommend the pool view rooms with a balcony so you can watch the sun go down behind the mountains. Click here to book your stay at the Silver Naga Hotel! If you’re on a budget but still want the great view, check out the Silver Naga’s sister hotel just down the road, the Elephant Crossing Hotel. They also offer a sunset happy hour on the deck! Click here to book your stay at the Elephant Crossing Hotel! 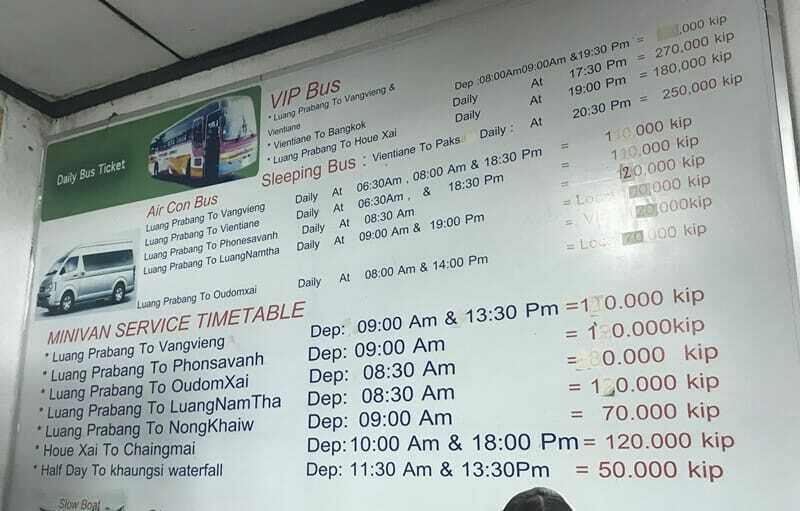 You can take a large bus (AKA “VIP bus”) or minivan from Luang Prabang to Vang Vieng, or you can take a bus or minivan from Vientiane to Vang Vieng. 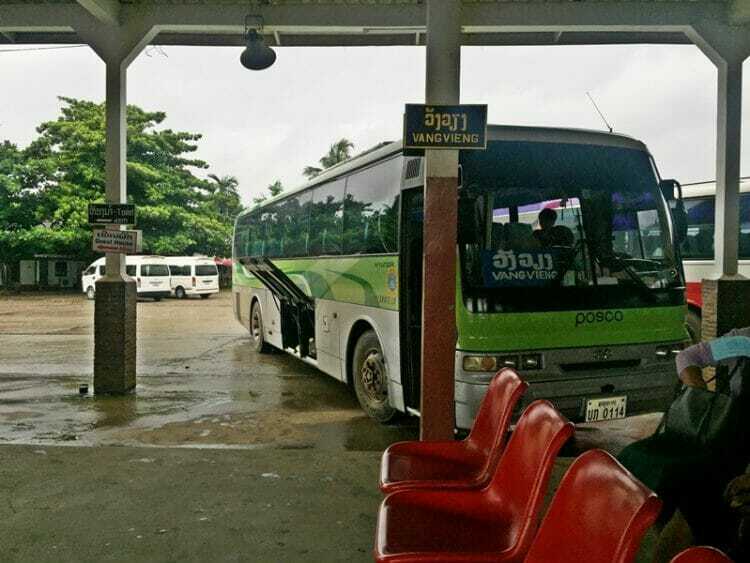 Buses run from Vientiane (drive takes ~4 hours) and Luang Prabang (drive takes ~5-7 hours) every day. 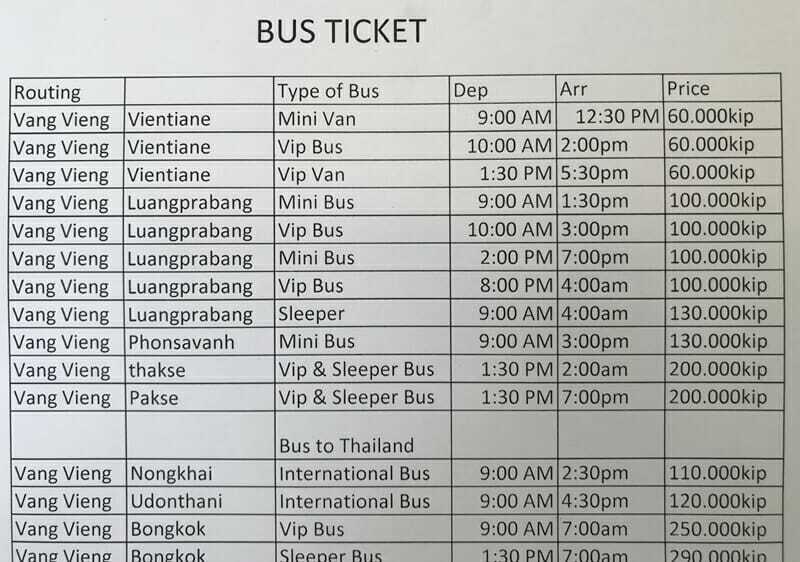 Get your hotel to book your bus ticket for you, or simply walk into any travel agent in Luang Prabang or Vientiane to purchase your ticket – prices are fairly standard across the board. 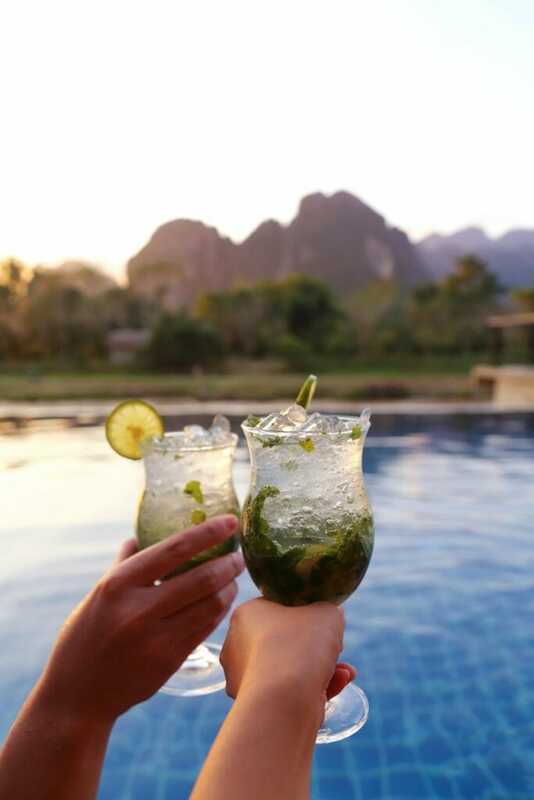 Where are the Blue Lagoons in Vang Vieng? They are all located across the river from Vang Vieng Town. To get to any of the 3 blue lagoons in Vang Vieng you will need to either take a tuk tuk or rent a scooter/ATV. I don’t recommend hiring a bicycle to get to the blue lagoons as it is at least 7 KM from Vang Vieng town to the Blue Lagoon 1, the closest lagoon. You can expect to pay approximately 80-100,000 Kip to rent a scooter for the day. The easiest way to get to the blue lagoons in Vang Vieng is to simply hire a tuk tuk – just make sure you agree on a price before you hop in. We paid approximately 250,000 Kip (30 USD) to rent a tuk tuk for 6 hours (including waiting time). Tuk tuk drivers know the directions to the different lagoons. You will also need to pay a small fee (approx 10,000 Kip) to cross the wooden bridge that spans the Nam Song River. 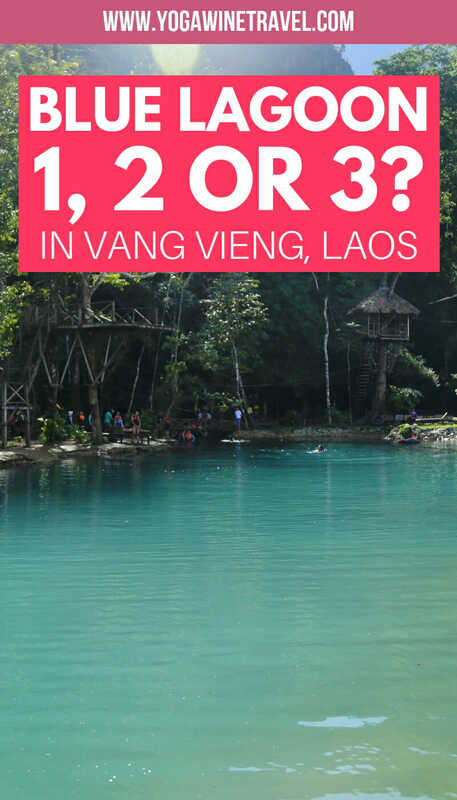 Keep reading for what you should know about the various blue lagoons in Vang Vieng! 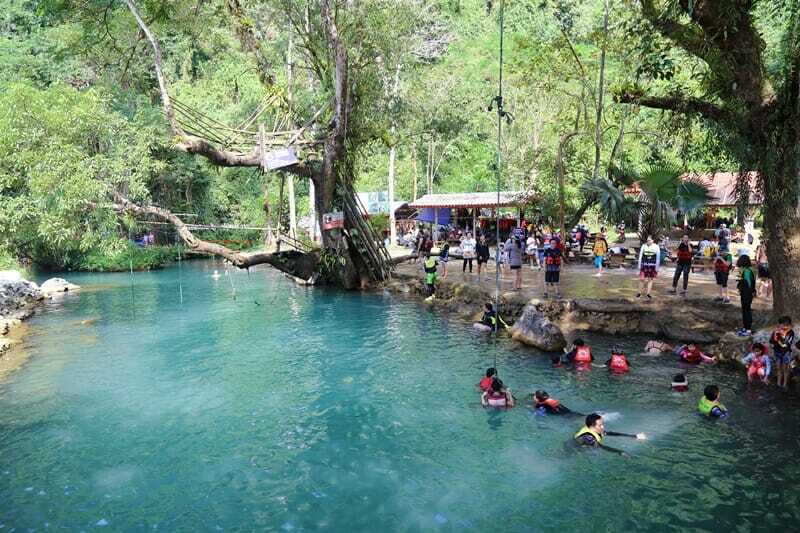 The most well known hot spot in Vang Vieng is the Blue Lagoon 1. For this reason, it is also the most crowded with busloads of tourists who head here for a day trip. 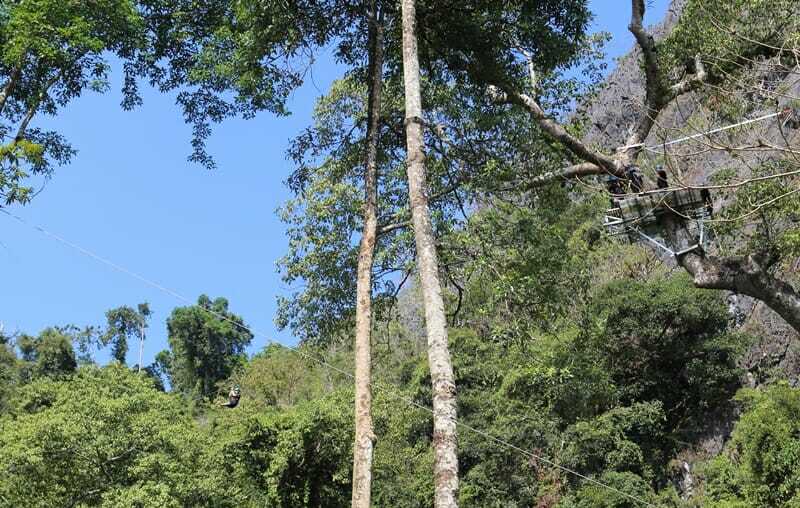 In addition to the lagoon, there is also a long ziplining course and the Phu Kham Cave for avid spelunkers. 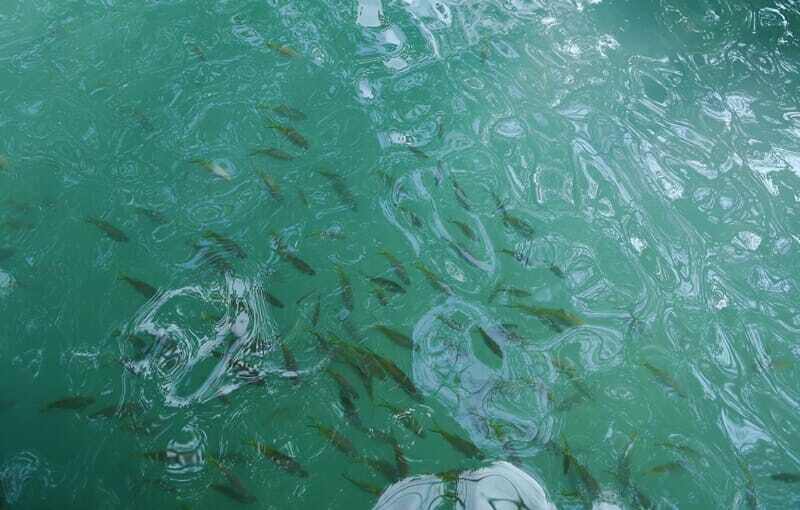 Just so you know, the lagoon does have a few fish in it so don’t be surprised if you get nibbled a few times! You can also expect a lot of people sitting by the bank of the lagoon just watching the shenanigans – personally this made me feel a little uncomfortable and I didn’t feel like I could just let loose. 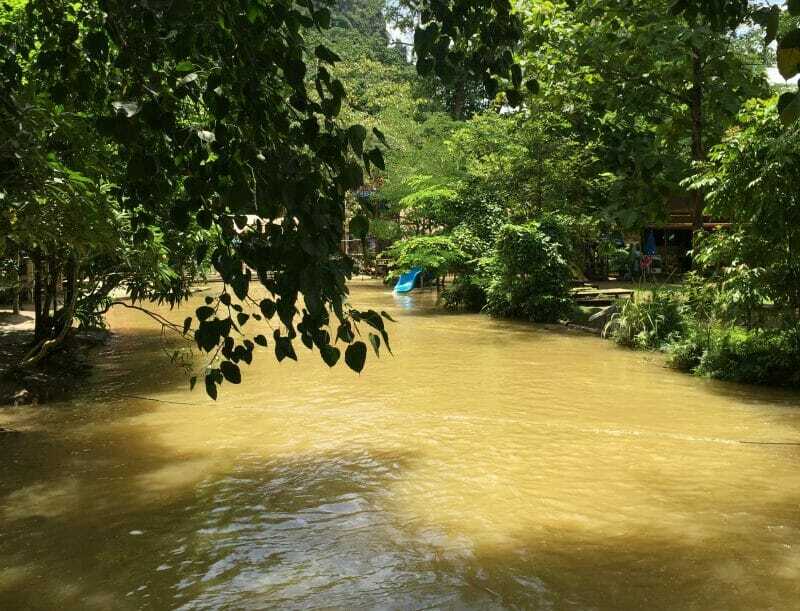 Because it is the most crowded, Blue Lagoon 1 is my least favorite one, but it is the most convenient one to get to from Vang Vieng town. The entrance fee is 10,000 Kip per person. The Blue Lagoon 2 is located about 7 KM southwest of Blue Lagoon 1, and has a number of different pools that you can swim in. There are small ziplines, swings and platforms and a number of deck chairs for you to sunbathe. Of all of the blue lagoons, I found that this one was the sunniest as there were no large mountains blocking the sun. There is also a “VIP pool” at the Blue Lagoon 2, but when we visited it had tons of brown chunks floating around in it- yikes. Blue Lagoon 2 had the least number of people – if you’re after a laid-back, relaxing lagoon experience, you might want to consider heading to the Blue Lagoon 2. The entrance fee is 10,000 Kip per person. The Blue Lagoon 3 is my favorite blue lagoon and the furthest from Vang Vieng Town (approximately 17 KM). To get there, you have to endure broken roads and an extremely bumpy ride – by the time we arrived, I was fairly sure that my tailbone was bruised after the hour-long tuk tuk journey. However, the long travel time is worth it because Blue Lagoon 3 is the most fun (IMHO) with a number of swings, ziplines, balancing beams and even a bamboo raft. If you only have time to visit 1 lagoon in Vang Vieng, make it this one! Though this is not as crowded as Blue Lagoon 1, there are still a fair number of people here so don’t expect to have it all to yourself. Feeling adventurous? Try to do a back flip into the lagoon off the massive swing! There is also a small shop here selling hot food, snacks and beer as well as toilets so you can easily spend an entire afternoon here. However, the Blue Lagoon 3 is fairly shaded as the sun is blocked in the afternoon by a large karst mountain, so the water can be chilly. The entrance fee is 10,000 Kip per person. Looking for even more exciting things to do in Vang Vieng? 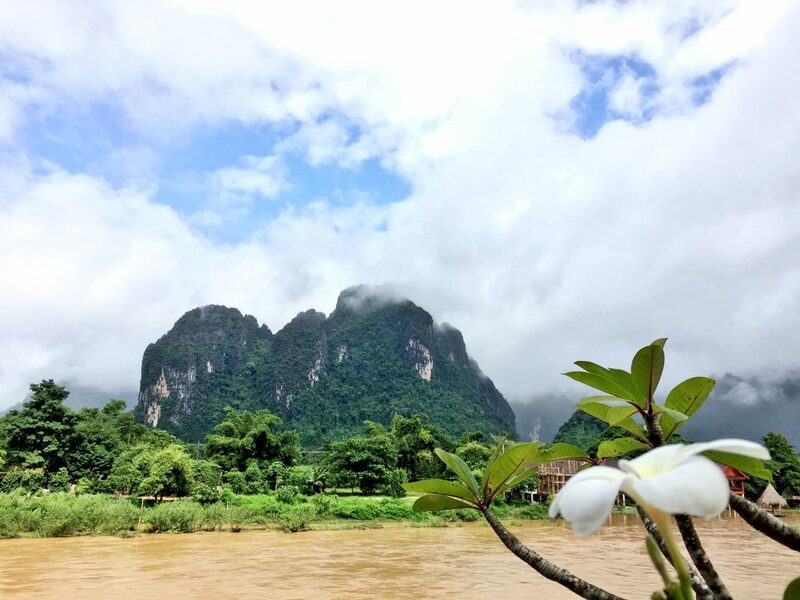 Read on for 14 adventurous things to do in Vang Vieng, or head on over here for 5 places you have to visit in Vang Vieng that aren’t the Blue Lagoon! 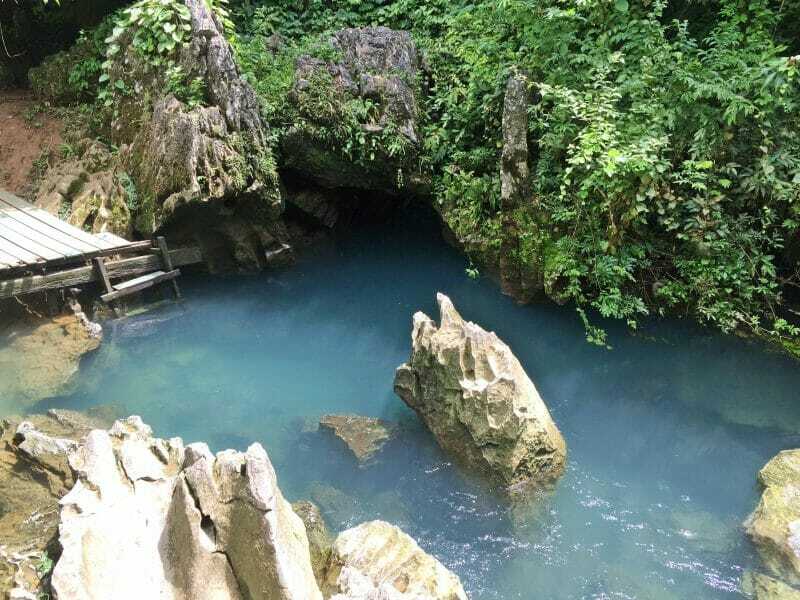 There is a small blue lagoon at the base of Tham Jang/Chang Cave that most people don’t know about. You can get to this lagoon on foot or by bicycle. To get there, head south from Vang Vieng town until you get to a fork in the road where you will see a sign for Jamee Guesthouse. 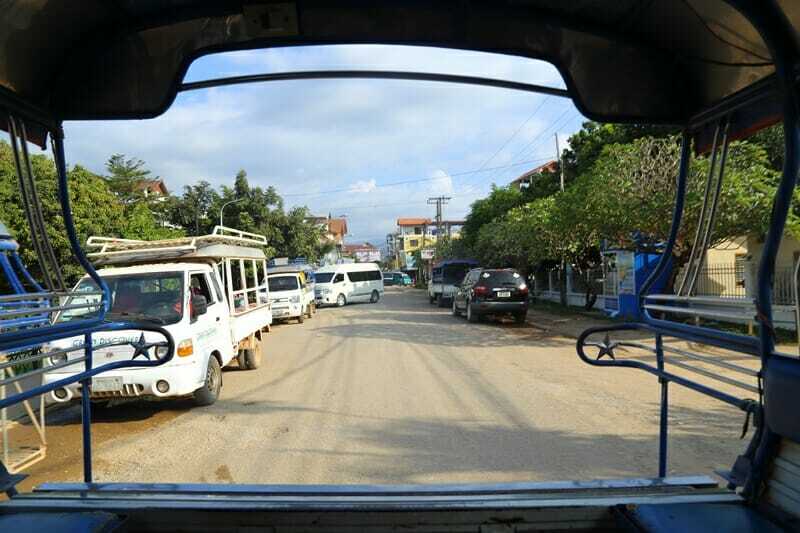 Turn right down the dirt road and keep going until you reach the gate for Vang Vieng Resort. You’ll have to pay a small entry fee here to get in. Keep going until you see an orange bridge – you’ll have to continue on foot across the bridge, turn left and follow the path until you get to the steps leading up to Tham Jang Cave. Take a left and you’ll see the natural blue pools! There’s no fee to swim in this lagoon and is sometimes even frequented by apprentice monks who go there to cool off in the summer months. 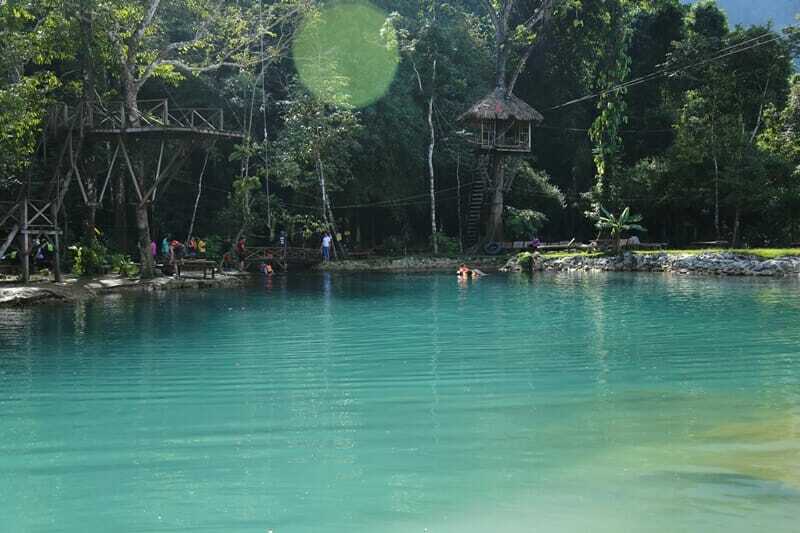 Unlike the other lagoons, this one tends to stay blue even during the rainy season from July to September. For the tl;dr crowd: head to Blue Lagoon 1 if you don’t want to travel far and want to try your hand at ziplining/caving, go to Blue Lagoon 2 for a relaxing, uncrowded day trip or the Blue Lagoon 3 if you want a mix of fun & relaxation. The entry fee for each of the lagoons is 10,000 Kip per person, or just over US$1. 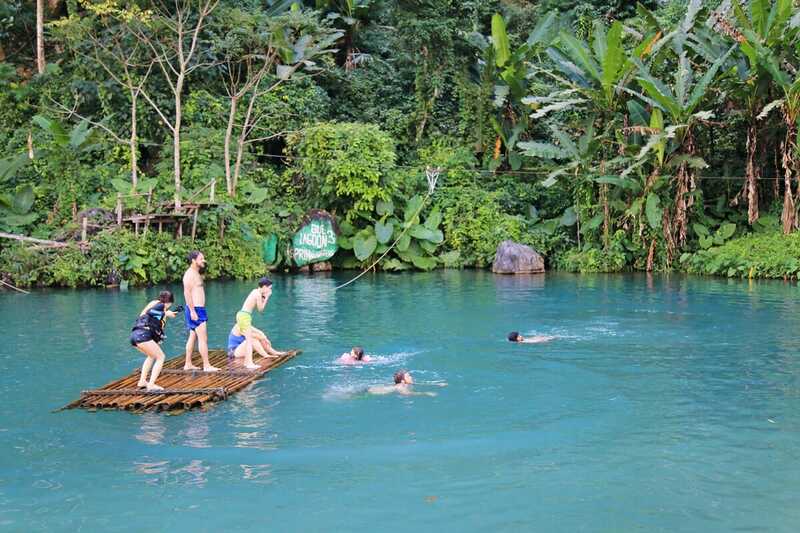 Ready to have a fun-filled day at a blue lagoon in Laos? 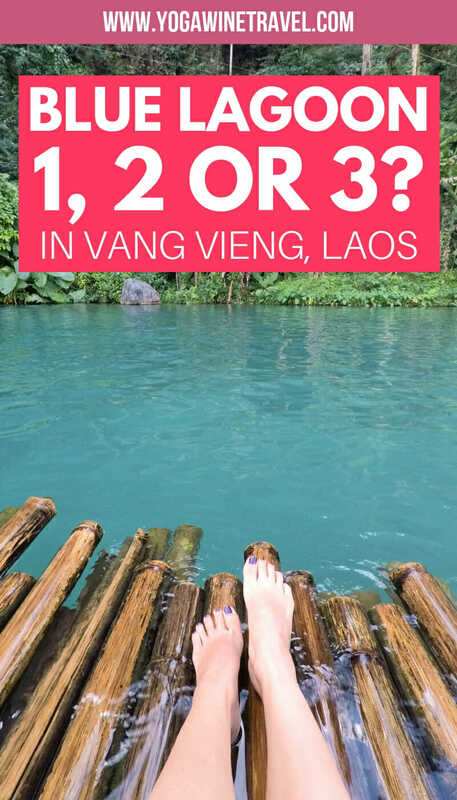 I hope this guide helps you choose which blue lagoon in Vang Vieng to visit? If you’re staying in Vang Vieng for a few days, why not visit all 3 blue lagoons? I recommend staying at Inthira Vang Vieng or the Silver Naga Hotel. Head on over here for even more Laos travel tips and destination guides! Which lagoon in Vang Vieng would you hit up first? Blue Lagoon 1, Blue Lagoon 2 or Blue Lagoon 3? Tell me all about it in the comments section!